Moses Bunde is a center forward playing for Lobi Stars FC, currently number 9 in the Nigeria Premier League 2010-2011. Despite being a teenager with only 5 league goals to his name, many experts consider Bunde to be a future star of Nigerian football. Lobi Stars FC, from Makurdi in the Benue State, is a modest club in Nigeria, famous for the development of young, inexperienced players. Bunde first made headlines during the 2009-2010 season when he scored 5 league goals for Lobi Stars FC between 31.01.2011 and 07.07.2011. After the season, Bunde was sensationally named in the squad of the Nigeria national football team. Nigeria was preparing for a friendly match against South Korea, played on 11.08.2010. Bunde was also part of the Nigeria national football team, preparing for the African Nations Cup qualifier against Madagascar on 05.09.2010. At the time of writing, Bunde has yet to make his debut for the Nigeria national football, but he was apparently on the bench against South Korea. Being involved with such a respectable national team, Bunde naturally caught the attention of European clubs. According to unconfirmed reports, Bunde was invited for trials by Portuguese top club Sporting Lisboa in August 2010. I have not found proof that this trial ever took part. However, it is a fact that Bunde travelled to Portugal in October 2010 for trials with Vitoria FC Setubal, also playing in the top tier of Portuguese football. According to most sources, Bunde was 17 years old at the time but there are also reports that suggest he was 18 or 19. Unfortunately, Bunde was not offered a contract by the Portuguese outfit. In November 2010, SuperSport.com described Moses Bunde as one of several players “who grabbed headlines” for performances in the Nigeria Premier League 2009-2010 despite “making unannounced entries to the top-flight”. 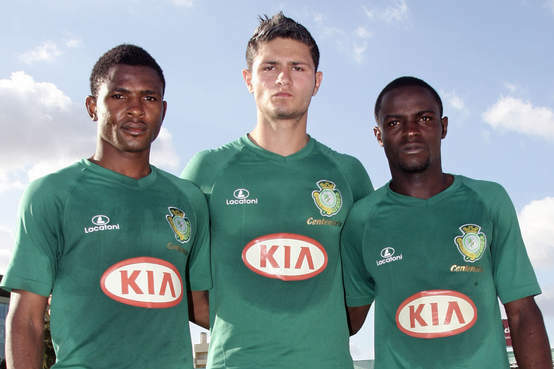 Bunde was trialing in Turkey in January 2011, apparently for top-flight club Karsiyaka SK from Izmir. According to Turkish newspapers and websites, Bunde was 18 years old at the time. Bunde failed to reach a contract and returned to Lobi Stars FC. Moses Bunde has yet to score in the Nigeria Premier League 2010-2011 despite playing several matches for his club. Based on the above, there seem to be some confusion regarding the age of Bunde. According to www.zerozerofootball.com, usually a trustworthy source, Bunde is born in 1993. I personally find it very likely that Bunde is a teenager, born in 1992 or 1993. It is not only the age of Bunde that is confusing; his name is spelled in several different ways. Bunde is also known as “Bunde Hungwa”, “Bunde Hungawe” or “Bunde Humgwa”. According to fresh reports, Bunde will be part of the Nigeria U-23 national football team for their Olympic qualifier against Equatorial Guinea. Bunde was also training with the Nigeria U-23 national team during February 2011. It is quite rare that such a young, inexperienced player is part of the Nigeria national football team. Being part of Nigeria U-23, consisting of many foreign based players, is also a sign of quality. Moses Bunde is obviously a player to watch but I personally hope he will spend a couple of seasons in the tough Nigeria Premier League. He will hopefully join a European club when he is ready for such a challenge. The picture is taken from All Nigeria Soccer. Bunde is the player at the right. Moses Orkuma, a central midfielder, has been one of the revelations of the Nigeria Premier League 2010-2011. Orkuma has developed into a key player for Lobi Stars FC, being almost ever-present, and already having three league goals to his name. Orkuma is born 19.07.1990. He was signed from Babanawa FC, playing at second level of Nigerian football, before the current campaign. His full name is Moses Terese Orkuma. Don’t be surprised if Orkuma proves to be a future star player of Nigerian football. Joshua Abanyi Aondongu(No. 35 of Lobi Stars Fc Makurdi) playing alongside Moses Orkuma will be a good pairing. Stephen from Gboko Benue State. I wish them best of luck. Dear Sir, correct – the other African player on the picture is Suswan. As far as I know, he has yet to play a league match for V. Setubal, but he was on the bench on 12.03.2011. It’s kind of strange that he’s not able to break into the first team because he has a good name in Nigerian football. Zerozero.pt is a great website! was not offered a contract? Is the left player in the picture – Terna Suswam. What is his story? He is yet to play his first game. Thank you for your mention of zerozero in your blog. The second player Orkuma is unknown to me.